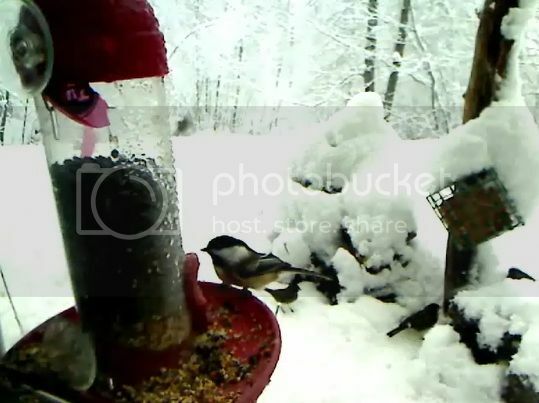 NovaBirds Cam Blog: Holy Snow!! Yesterday we got one whopper of a snow storm! Because the BirdCam is located in a higher elevation, we tend to get even more snow than most of the region. At one point the snow knocked out power and the cam was off air. When the cam cam back online, it was amazing to see just how much snow had fallen! There were a few birds around, but most of them had definitely taken cover somewhere safe until the storm was over. There should be a lot of activity today. I have already seen bluejays, chickadees, dark-eyed juncos and both the male and female downy woodpeckers! It's very busy!